Professor Yuji Yamamoto at Nagoya University and his colleagues1 have discovered that a physical law is applicable to association football (known as "soccer") matches. Their paper was published online in European Physical Journal Bon February 19, 2014. Several sports science studies have previously been conducted through psychological and behavioral approaches to individual action and through the probabilistic approach on the basis of scores and records. However, collective behavioral analysis employing a overhead view of the entire team has not been conducted. Prof. Yamamoto's research group treated a team as one being, rather than focusing on individual action. They analyzed two games: a quarter-final game in the 2008 FIFA Club World Cup played by Gamba Osaka (the Asian champion club) against Adelaide United (the champion of Oceania) and a regular season game in the 2011 Japanese soccer league featuring the Urawa Red-Diamonds versus the Yokohama F-Marinos. They recorded the games from an overhead view and created graphs showing the relationships between ball position and "frontline," the boundary separating respective team positions, which are determined from the set of individual range of difference (see the movie above). The results revealed that the graphs have fractal patterns, i.e., self-similarity between a part and a whole. The researchers found that movements in 5-minute and 1-minute time ranges have similar features, while differing in time and space axes. They also confirmed that persistence time in professional soccer matches is approximately 30 seconds; this implies that football dynamics is influenced by memory effect for about 30 seconds. Currently, Prof. Yamamoto is expanding the scope of this research to other ball sports, aiming to discover physical laws in each sporting activity and to contribute to emergency procedures based on his sports-analysis knowledge. Furthermore, with further progress in data acquisition technology and analytical techniques, the research group may realize a new service using real-time positioning information. These research outcomes are expected to be widely applied in fields beyond sports science. 1. Collaborative research with Associate Professor Akifumi Kijima, Associate Professor Hiroyuki Shima at University of Yamanashi and Dr. Keiko Yokoyama at Hokkaido University, funded by JSPS KAKENHI Grant. In daily life, people unconsciously perform complex movements, even in unpredictable environments. 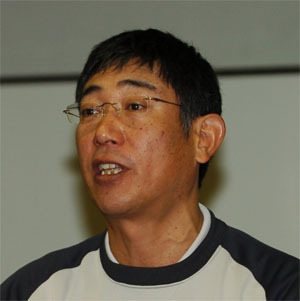 Professor Yamamoto focuses on human behaviors in sports, such as tennis, soccer, play-tag, and Kendo, and aims to explore the principles that rule our actions. It appears that following these simple principles, human beings make complex movements in sequence. He believes that complex movements generated by simple rules captivate people and impress them with the grace of the movements. "Human behavior, individual or collective, might have various regularities, just like natural and life phenomena. There are many mysteries in complicated actions in sports. I believe that unraveling these mysteries will lead to a further understanding of human beings." "Surprisingly, we are not really aware of our own behavior. If you shift your focus on the movement of the mind as well as that of the body, you might find out what you think obvious is not that obvious. What is important in research is not whether you can do or not, but whether you dare do or not."